Barry Bonds is in town so Milwaukee is buzzing, especially as he gets closer to the home run record. We?re all baseball fans in our clubhouse, so there?s a little added interest among players, too. I guess it will be interesting to see how much he plays while he?s here. If he hits one tonight, for example, I don?t know if he?ll be in the lineup on Saturday and Sunday. I noticed that the Cubs had record crowds when Barry was in Chicago. Barry or no Barry, we?ve been getting big crowds in Milwaukee, especially for the weekends. I?d imagine we?ll have sellouts with Barry in town. I?ve followed Barry?s career pretty closely over the last 10 years while playing against him. We?re both left-handed hitting left fielders in the NL so we have at least that in common. But I?ve been watching Barry a lot longer than that. Growing up in Sacramento, the teams we followed were the A?s and Giants. I?ve followed every step of his career. He?s been a joy to watch as a fan and a player. His run has been unbelievable and, now, to see him this close to the all-time home run record is mind-boggling. I?m excited for him. Barry has had a magnificent career and who knows if he?ll even play next year, so the games playing against him this season are kind of special for us. Since I?ve been in the Major Leagues, I?ve always had a great relationship with Barry. From Day One, he?s always been really friendly and joked around with me. I?ll never forget playing with him on the All-Star team in ?03 when I got a chance to talk to him for a long time about hitting. I imagine he?s got to be pretty satisfied right now. I?ll never have anything bad to say about the man. Barry?s always been great to me and the guy is the best player I?ve ever seen. I had a nice restful All-Star break back home in Phoenix. As expected, it was hot in Arizona ?- I think it went up to about 106 degrees ?- but it could have been worse. It was even hotter the week before. Someone told me it was up to 114. So I didn?t exert myself too much. I had some friends over for a little barbeque, went in the pool and just really relaxed. I didn?t do too much of anything. A little R&R never hurts. As for our club, we?ve won our first two series since the break and we?re right where we need to be. We?re playing well, especially at home. Everyone?s a little nervous about losing Sheeter for a little while. I?m guessing we?ll be without him for about a month. It?s natural to be concerned. Benny is our horse and we definitely need him as often as he can get out on the mound. The positive I take from the situation is that Benny will get some rest for his whole body -? not just his finger. His legs, his shoulder and his elbow will be strong and ready for that stretch run when he gets back. We?ll have him well-rested and at full strength. In the meantime, Yovanni Gallardo is going to do a great job filling in while Benny is out. He?s a strike thrower, he?s got great stuff and he also has tremendous poise on the mound. He?s only 21 and he made his first big-league appearance only a month ago, but he doesn?t seem fazed stepping into this role at all. He?s a competitor. As you can imagine, this is turning into a really fun season for all of us on the Brewers. It?s just a lot more fun being the hunter instead of the huntee for a change. I?ve never really been on a contending team this late in the season. It?s been a long time since this organization has contended and we want to make the most of it. As someone who?s been around for a while, I can tell you that these opportunities don?t come around very often. But it?s still way too early to get caught up in the standings or talk of a pennant race. That stuff is irrelevant right now. We just need to keep doing what we need to do, which is win ballgames. When it gets to September you wouldn?t be human if you?re not watching the standings. But there?s plenty of baseball to be played between now and then. We need to keep focused on getting prepared and winning ballgames on a day-to-day basis. The key is playing well enough in July and August that we?ll be interested in looking at those standings come September. There?s been a good rivalry between the Cubs and the Brewers ever since our club moved from the AL to the NL in 1998 — my rookie year — because of the proximity of our cities. Over the years, fans have seen everything from slugfests to pitching duels to walk-off homers to win games. But this past weekend was different because we?re in first place and they?re in second place. There was more on the line. The atmosphere was great but as it turned out we only won one of the three games at Wrigley. Now we?d like to finish the next week strong as we head into the All-Star break. Then we can get a few days? rest and try to come back and pick up where we left off. Somebody mentioned to me this morning that we have the best record in the NL at the halfway mark and wondered if back in Spring Training I could have envisioned such a strong first half for our club. Well, everyone wants to have the best record, but you never really know. I felt coming out of Spring Training that we were going to be a good offensive club and our bullpen was set up kind of nice. So I thought we had the right formula for winning but until you actually get on the field and do the work, you don?t really know. I did think we had a chance to win a lot of games, though. I?ve said in the past that we have a good mix of talented young players and veterans but I?m not sure anyone understood just how talented some of these young players are. Ryan Braun came up and immediately gave us a jolt with his offense. Corey Hart has come on strong since going into the leadoff spot. He?s doing a tremendous job. J.J. and Prince are obviously having great seasons -? they?re All-Stars. I think we have a situation in which everyone is doing their part and contributing to the success. 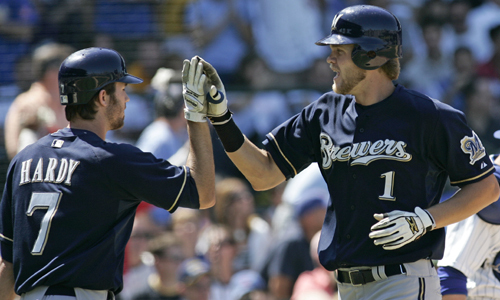 Craig Counsell and Tony Graff are having great at-bats and Damian Miller had that walk-off homer for us at home the other day. It seems like we have a different hero each day. I was lucky enough to play in an All-Star Game once in 2003, but usually I?m one of the many players getting a few days off and watching from home. I?ll typically just watch the pregame ceremonies and the intros then watch a few innings to see my teammates bat or pitch. I rarely watch the entire game because All-Star Games go on for a long time with all of the substitutions and other distractions. But this year I might have to stay tuned a bit longer considering four of my teammates are in the game. I?ve got to watch Prince and J.J. hit. I?ve got to watch Sheets pitch and I imagine Francisco Cordero might get his turn to pitch pretty late in the game, maybe even the last inning. J.J. faced some tough competition at shortstop in our league with guys like Jose Reyes, Jimmy Rollins and Hanley Ramirez. He really earned his place on the team with that kind of competition at his position. Prince definitely deserved to get the chance to start the All-Star Game, but considering the size of our market, I was absolutely amazed he got the popular fan vote. It shows you how fast he?s making a name for himself around the league. Foremost, he?s such a great, fun-loving guy to have around the clubhouse on a daily basis. He?s turning into a superstar and the Brewers are lucky to have him. Maybe I?m biased, but I really don?t think it?s a stretch to say he?s been the first-half MVP in the National League. So I?m really happy for Prince. He?s going to be in the Home Run Derby, too, and I hope he really gets to enjoy the total experience out in San Francisco. There are always going to be people worried that he?ll mess up his swing trying for home runs, but you know what? There are no guarantees. He should just go have fun and enjoy himself. I was fortunate to get on the team in ?03 and you can?t really explain the feeling. Just being around all of the other great players for a couple of days is an unforgettable experience. The rest of us on the Brewers will be anxious to get back to the regular season. Winning has made this season a lot of fun so far and I think it?s going to get better. Our club is energized and our fans are energized. It feels great to play home games with the kind of big crowds we?ve been getting in Milwaukee in recent weeks. Good things happen when you?re winning. Posted by MLB.com on Jenkins’ behalf. Luckily, the other teams in our division didn?t capitalize when they had a chance. We were able to hold our ground and now it?s time to get back to our winning ways. Winning three out of four games from the Marlins was a good start. It wasn?t that we were playing that poorly. We were just on the wrong end of some close games for a while there, particularly when we were out West. We didn?t really get blown out by anybody. One game we might not get the great pitching and the next we might not get the clutch hit we needed. So many times in baseball a game will turn on one pitch or one hit at an opportune time. That just didn?t happen for us during that stretch. Plus, you need to give credit to our opponents sometimes. New York, Philly, LA and San Diego all had some really strong pitching performances against us. Plus, we weren?t playing our best baseball when we were going through those cities. If we had been playing like we were earlier in the season, the results might have been a little different. Baseball has ups and downs. But the good news is that we?re still in first place and we?ve maintained our lead in the division despite having that rough stretch. We just have to keep going now. We never lost sight of our objectives during that rough stretch. We have a resilient group of guys in our clubhouse. We have a core group that?s pretty young and talented, but we also have some veteran guys and some guys who have really been around for a while like Damian Miller and Craig Counsell and Tony Graffanino. We have super clubhouse. We have a lot of fun together and enjoy ourselves and each other. That makes for some pretty good team camaraderie on a daily basis. Nobody is getting themselves worked up looking at the standings; we?re just having fun playing baseball. Believe it or not, Prince Fielder has become the guy in the clubhouse who really keeps things loose these days. He?s got an unbelievable personality. He?s got this infectious laugh ?- I?m laughing right now just thinking about it ?- that takes over the room. He keeps it light, always joking around — up until it?s time to get to work. He takes the game as serious as anyone. Prince has done well ever since he got here. But this last month or so has been the best we?ve seen from him so far. He had 13 home runs and 28 RBIs. Every time I looked up, it seemed like he was on base or circling them. We know he?s a special player, but last month, for the first time, there really was that "wow" factor. Prince is getting better every day, especially as a hitter. He?s a superstar in the making and he?s going to become one of those guys whom you can depend on for 40 homers every season. He?s level-headed, too. But none of this is really a surprise. The first time I ever saw him in big-league camp, you could see it then. He had the mechanics already. He was never wide-eyed about playing in the big leagues or going to big crowded stadiums or facing a certain pitcher. He?s just a confident guy and knows how to go about playing the game. Obviously, everyone?s heard by now about four of our guys -? Chris Capuano, Bill Hall, J.J. Hardy and Jeff Suppan ?- filming an episode of ?The Young and the Restless? soap opera. Rest assured those guys have gotten an earful from the rest of us in the clubhouse about it. They all had fun doing it, though, and from what I?ve heard, nobody really screwed up and everybody got their lines right. But we?ll see. We?re kind of looking forward to getting a tape of the show. We?ll all take a glance at it and I?m sure that will start a whole new round of razzing. My mom, while I was growing up, used to watch ?Days of Our Lives? so I watched that once in a while, but I can?t say that I?ve ever watched ?The Young and the Restless.? Who knows, though? Maybe I?ll get hooked on the show after watching my teammates? Lastly, thanks for all of the suggestions I?ve received for naming the blog. I?m beginning to go through them. Keep sending them in and keep rooting for the Brewers. My 200th home run turned out to be a memorable one. It was fun to hit it in an important situation. It was a three-run homer that tied the game, and the team definitely needed a jolt at that point. I consider that part of my job description, so it just felt good to come through when we really needed it. While the milestone home run was obviously something I?ll never forget, the run-scoring single I hit down the left-field line in the bottom of the seventh inning of Sunday?s game was probably even more crucial because it put us ahead and left the game to our bullpen, and I love our bullpen in a situation like that. It was big because we had just lost a few tough games on the road trip to some pretty tough teams — the Mets and Phillies -? and then the first two at home against the Twins. So the timing was right. I think the home run helped wake everybody up. That last road trip was difficult, though. We went up against some very good pitchers who threw the ball well against us. We got ?walked off? a couple times in Philly in games that could have easily turned the other way. But that?s baseball. You have to give them credit. Cole Hamels in particular pitched an unbelievable game against us, so it looks like he?s the real deal. Over the course of the season, we?re going to lose some tough games. The important thing is having the confidence and the ability to bounce back and keep going. But it looks like we?re beginning to come around again in recent days. Hopefully, we?ve gotten past a difficult stretch. We had another big offensive game on Monday night against the Dodgers before last night?s game, which was more of a pitcher?s duel. Before I forget, I want to give a special thanks to all of the Milwaukee fans out who treated me so well over the weekend when I hit my 200th home run. The fans? reaction will never be forgotten. 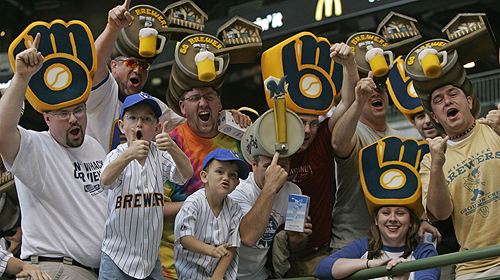 Brewers fans have been great with me for 10 years now. They?re pretty special and it meant a lot to me. Hitting the home run in front of the home crowd made it so much better. The club posted a big congratulatory sign on the scoreboard and the fans gave me a nice ovation. Having it come at home as part of an exciting win was very gratifying, to say the least. It?s also one of those things that allows you to take stock in your career a little, too. It made me recall my first home run. It was in ?98 against Orel Hershiser in San Francisco, my third at-bat of the game. I just remember wanting to get back to the dugout so fast that I sprinted around the bases. The win, together with the milestone home run, made for a pleasant trip out here to the West Coast. The trainers and staff gave me a couple of bottles of champagne that I shared with the team on our bus ride to the hotel on the way in. It?s nice to be recognized by the people you work with every day. It kind of validates all of the hard work and effort you put in on the field. It was real nice that they?d do something like that for me. But the celebrating ended on Sunday night because we have another tough road trip out here, facing the first- and second-place teams in the NL West. In the first game against LA, our bats were working again, which is a good sign. Rickie Weeks had four hits and Prince Fielder had a couple home runs. It was like the offense we had in the first 40 games. Everybody contributed with a walk or a hit. That was more representative of the team we?ve been like this year. Last night?s game was more of a pitcher?s duel and we wound up on the wrong side of it. But you can?t really expect sweeps on the road, especially when you?re playing the good clubs we?ve played recently. If we can win two out of three in a series like this, that?s fine. Then we can take care of business at home. Coming to the West Coast is always like a homecoming for me, too. I grew up in Sacramento, but I went to USC so I get to see a ton of people I know at the games. That?s always a pretty cool for me when I come out here. You don?t get to see all of these people very often, so it?s extra special when you do have the chance to visit with them a little. One of the great parts about a career in baseball is the big circle of friends that the game gives you. You establish long-lasting friendships with former teammates and coaches and other folks from every stop along the way. It?s a pretty cool thing. Surprisingly, on this trip I?ll be visiting with a lot more people when I get to San Diego than here in Los Angeles. Maybe a lot of folks have moved down there? Regardless, everyone seems to come around when I get out West. I have family and friends coming in from Sacramento, too. You try not to let any of that off-the-field stuff affect how you go about your business, though. As baseball players we have a lot of different things to deal with off the field -? media, family obligations, whether you?re playing well or struggling ?- but you learn to compartmentalize a little bit. You want to visit with everyone, but at some point, you need to put it aside. It?s hard, but you learn over the years that you have to say "No" once in a while and keep your priorities in order. And the priority now is winning games. Finally, I thought it would be fun to ask Brewers fans to help me give a name to my new blog. I?m OK with "Jenks? Joint," but I?d like to hear from some of the creative people who might have a good idea, so post away and let?s see what you come up with. I?ll review them and see if I find one I like. Everybody around the Brewers, from players to fans, is getting pretty excited about the start we?ve had this season. But we know we still have our work cut out for us and that there?s a lot of season left. It?s as much fun as I can remember having with this club. Before our current road trip we won nine of 10 games on a home stand. 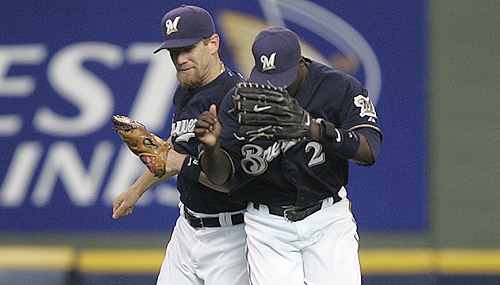 Nothing like that has ever happened in my previous nine or 10 seasons with the Brewers. This is the best team that I?ve been part of. We?ve got a great mix of young talent with veteran guys. We expect to win. This is the first time in my career I can honestly say we come to the ballpark every day expecting to win. It?s an attitude we haven?t had here since I?ve been in Milwaukee. It begins at the top with committed ownership, a great general manager (Doug Melvin) and assistant general manager (Gord Ash) who?ve put together the right mix of players and it works its way down from there. The only thing that can stop us from contending this season is health. If we can keep everybody healthy this team has a great chance of not just getting to the playoffs but winning in the playoffs. The great thing about our clubhouse is that mix of veteran and youth. We really don?t have any weak links on our team. Literally, the guys on our bench could start for a lot of teams. We have talent and depth. We have a few superstars but, overall, the big advantage we have over the course of a long season is going to be our depth. We have a lot of options. It seems like we have a different hero every day. We don?t rely on one or two guys, which in turn means everybody feels like they?re part of it. Somebody steps up and does something to help us win almost every day of the week. We feed off of each other. Most people realize we have excellent starting pitching with Ben Sheets, Chris Capuano, David Bush, Jeff Suppan and Claudio Vargas. But another one of our advantages is that in Derrick Turnbow and Francisco Cordero we have two closers we can rely upon at the end of a game. These days when I go to the local Starbucks or Einstein bagels to have breakfast people are genuinely excited. They obviously haven?t had a winner in a long time and they want some new memories. They want to identify with a new team and a new era. The fans seem to especially love the energy our club generates with the talented young players like Prince Fielder and J.J. Hardy and Cory Hart and Rickie Weeks and Billy Hall. They?re hungry, they?re talented and they work hard. All of them are no-nonsense guys who are extremely focused on getting the job done on the field. I think the fans can sense this by the way they play and by the way they carry themselves. This is a pretty special group of players. But as good as we?ve played in the early part of the season, I still think we can improve. There?s another level we can reach with our offense. Everyone is pitching in right now but nobody?s been on a real tear yet. We?re still learning about one another and getting better as a team. That will equate to a lot more wins before it?s all over.